May 29 Bangor Daily News…Tales from Mighty Mount Katahdin written by me! If you are a yoga retreat guest or someone coming to our site for the first time this is my personal musings..for news and things about the retreat please go to the blog at the top of the website homepage..meantime here is a bit more education about the personal challenge I am facing, we all have them, and maybe something that is educational if you think wind energy is green….. This was printed in the Bangor Daily News along with some other stories of the Great One..thanks for reading..and to learn more go to wind watch or Maine Wind Task Force online or see the movie WINDFALL available on DVD. “ Donna Sewall Davidge of Island Falls relates what the natural beauty and history of Katahdin means to her and her family. 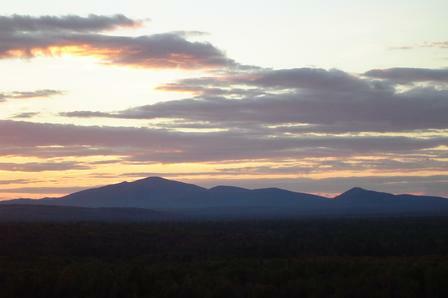 Mount Katahdin means the “Great One,” as the Indians called it. It rises majestically as you view it from the scenic overlook on I-95 or from various points in Island Falls, where Theodore Roosevelt started from when he climbed it. It means wilderness and wildlife and, thanks to the vision of Mr. Baxter, it meant preserving it for Maine and its people. When Theodore Roosevelt climbed it, he was with my great grandfather William Sewall. It means a lot to me to keep the tradition alive — of friendship that can be made in nature, which doesn’t judge you for what you have or who you know. Nature treats all equally.